The thing about food trends is that often what comes around isn’t new at all, but something quite old that we appreciate in new ways. Bone broth is one (and huge props to New York chef Marco Canora for creating the market for old-school stock with his Brodo takeout window). Ghee, the Indian-style clarified butter, which started trending in a big way a couple of years ago is another. I’m all for it — ghee is simple stuff with a big flavor punch. Basically, it’s clarified butter on steroids, cooked until its water has evaporated and the milk solids drop to the bottom of the pan where they gently brown and lend the ghee intensely rich, nutty flavor. Removing the milk solids also makes ghee more digestible for folks who are lactose intolerant, as well as shifting it onto the “OK” list for people who follow a paleo or Whole 30 diet (especially if it’s made with grass-fed butter). In Ayurvedic medicine, ghee is prescribed for everything from poor digestion to poor eyesight. The folks at the Harvard School of Public Health aren’t so sold and still say plant-based oils rich in unsaturated fats (yes, olive oil) should be your first choice. Whichever side of the nutritional fence you’re on, ghee is undeniably fabulous stuff in the kitchen. In addition to rich flavor, it boasts a high smoke point of 465°F (vs. 350°F for regular butter), making it a great choice for high-temperature cooking. It’s also shelf stable, so you can keep it a cupboard for months and in the refrigerator indefinitely (but you’ll use it up long before that). It’s an obvious choice in Indian dishes, like this Red Lentil Dal with Caramelized Onions. But ghee’s appeal goes way beyond traditional Indian fare. You can use it in place of other fats for literally anything, from fried eggs to popcorn to roasted vegetables. I’ve long loved it in baked goods, like these Crispy Chocolate Chip Oatmeal Cookies, where it adds earthy flavor and even more indulgence. It’s a favorite go-to when I want to add heft to meatless dish. I cook for someone who doesn’t eat bacon anymore, so when I make these lima beans, one of our favorites, I’ll skip the bacon and sauté the aromatics in a couple of tablespoons of ghee, plus a generous pinch of smoked paprika and cumin. You’ve always been able to buy ghee in Indian markets, of course, and now it’s fast becoming a supermarket staple as well with brands like Ancient Organics, 4th & Heart and Organic Valley, which has been doing a big marketing push recently. But like so many of these classic basics, ghee is crazy-easy and fun to make (far simpler than making stock — sorry, bone broth). It’s not even a recipe, really, so much as a simple procedure. Ghee concentrates all the qualities in the butter, so opt for a good-quality brand, however you interpret that. I always use organic and, if I feel like spending a bit more, grass-fed butter. Always use unsalted butter, because this is really a component that ends up incorporated into other recipes and you don’t want a super-salty ghee that might throw off the flavor a finished dish. And even if you burn it, go ahead and strain it as directed. 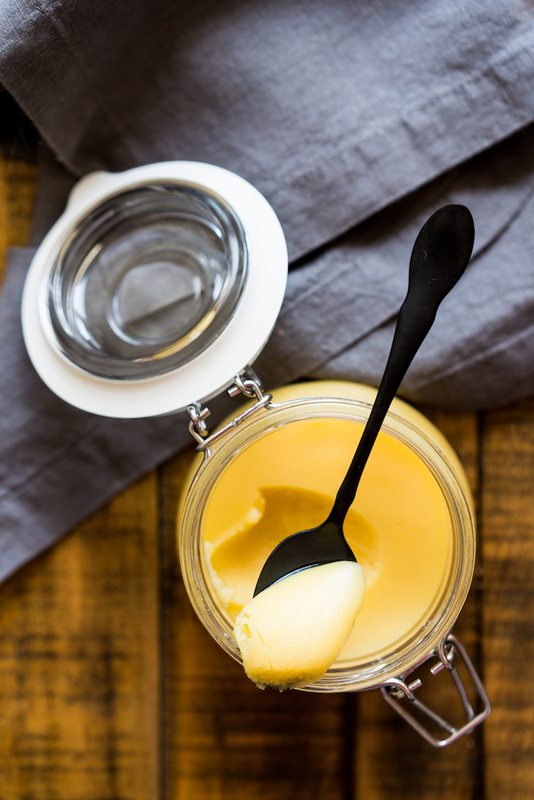 What you’ll end up with may not be true ghee, but you’ll still have the most amazing beurre noisette in a jar that you’ll want to use in everything. I won’t lie: sometimes I do that kinda sorta on purpose. Place the butter in a small stainless-steel saucepan over medium-high heat. Once the butter melts, it will start to foam. Reduce the heat to medium and skim foam from the top. Cook until the milk solids drop to the bottom of the pan and turn golden-brown (gently tilt the pan so you can take a peek). The ghee will bubble vigorously at first and quiet down when it's nearly done. Depending on the type of butter you use (some brands have higher water content than others), the dimensions of your pan, how much heat your stove kicks off and whether you use more or less butter than called for here (which is totally fine), this process can take 10-20 minutes. But instead of setting a timer, just keep an eye on what's happening in the pan. Strain the ghee through a cheesecloth-lined fine-mesh strainer into a clean 1-pint jar. Cool and cover tightly. Store in cool, dry cupboard for up to 3 months or refrigerate indefinitely.